1. Be bold and paint your ceiling black. Nothing screams industrial than a combination of raw finishes, wood, bricks, and hints of black to give it an edge. Painting the ceiling black adds an oomph to the look without taking away the attention from the unit's overall design. It also complements the warm tones and metal finishes. 2. Set the mood with the right lighting. In this unit, there are no floor lamps—helping the owner save on floor space. He invested in hanging lighting pieces, adding to the relaxed coffee shop vibe he's going for. The best part? He opted for Edison bulbs, a hot trend these days. Choose dimmable lights so you have the freedom to adjust it according to your liking and the task you're working on. Aside from exploring the possibility of having exposed wires, you can also look into droplights with interesting shapes. 3. Invest in solid wood flooring. One of the first things guests will notice in the unit is the shiny, envy-worthy flooring. 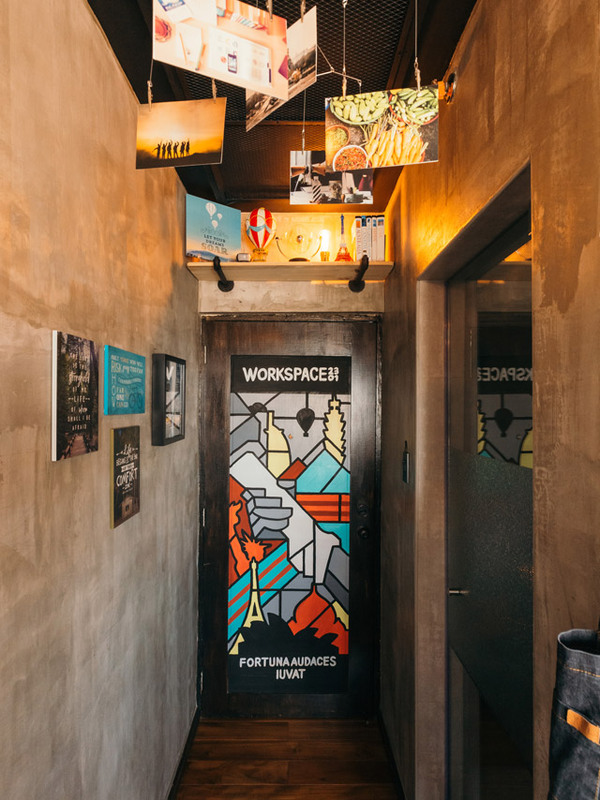 Instead of settling for the original flooring upon turnover, the owner decided to invest in solid wood, a move that amped up the style of his workspace. It adds warmth to the space and works in contrast against the bare walls and brick accent wall. 4. Shop for multipurpose furniture. You know this by heart—in a small space, a sofa bed can help you enjoy the comfort of a bedroom and a living area with just one piece. 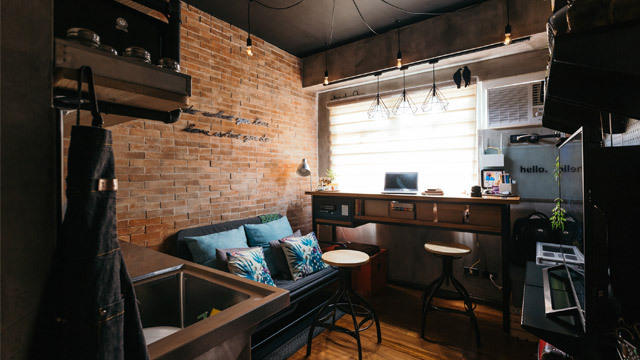 Aside from this multipurpose must-have, you can also opt for a customized bar table that's similar to the one seen above—it can be used for working, dining, and reading. The bonus? It has storage compartments underneath to help you control clutter. 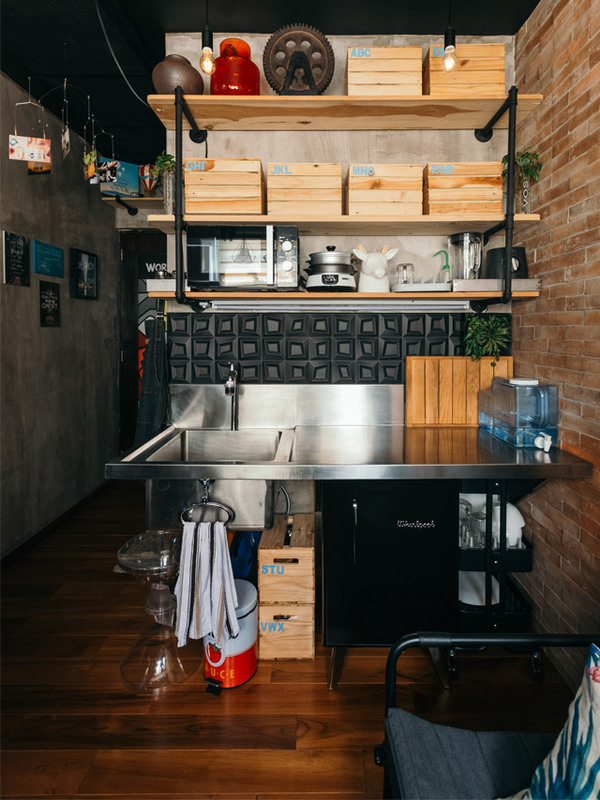 Hooks, open shelves, overhead cabinets, and rods come in handy as favorites when it comes to creating nifty vertical storage options. 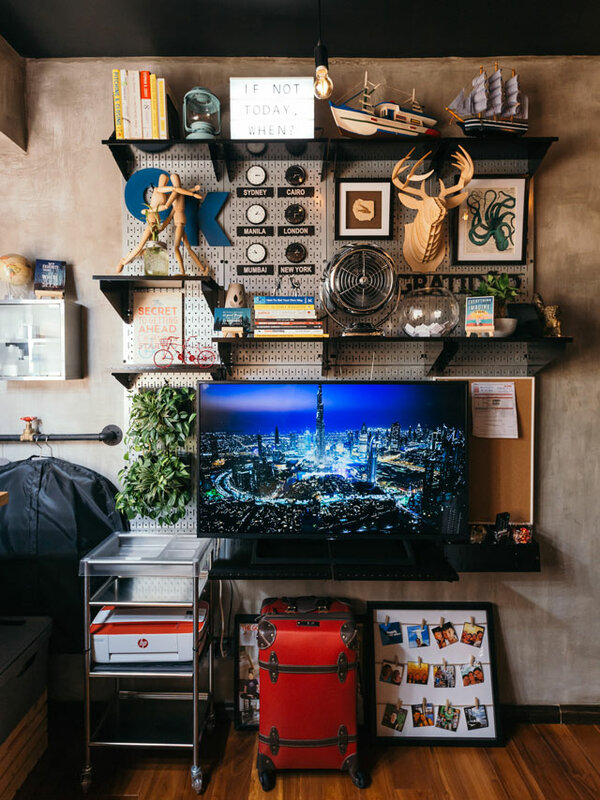 Take your cue from the photo above by working with a pegboard. It can serve as your storage and decor center where you can hang hooks, display photos, and even install shelves. 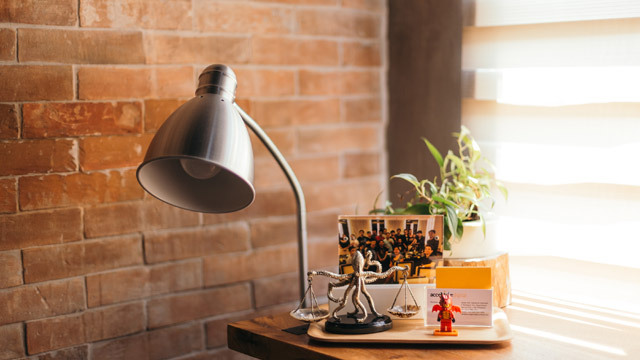 You can also use it as a command center where you can take note of bills, lists, and other important reminders. 6. Add plants to balance out the industrial elements. Given the limited floor area, adding huge potted plants can be difficult. 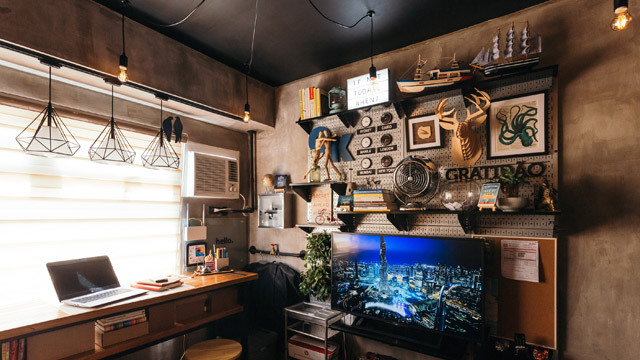 To add a refreshing touch, the owner inconspicuously placed small potted green wonders in unexpected nooks—one on the table, a couple seen on the pegboard, and another in the kitchen. These green additions work like magic without disrupting the industrial look. As an alternative, you can also work with succulents and air plants. 7. Keep within the theme but feel free to inject pops of color. The industrial style is known for its monochromatic palette dominated by neutrals. Keep your space from being boring by incorporating hints of yellow, red, and green. You don't have to paint a wall or the ceiling to achieve this—a well-placed mural (like an artwork at the back of the door), wall accents, and cute prints can get the job done, too. 8. Complete the space with movable essentials. Furniture and accessories you can move from one place to another with ease are musts in a small space. Carts with wheels that give you extra storage, stools, and stackable chairs are welcome picks in a tiny home. 9. Maximize every nook and cranny with storage bins. Bins that go well with your theme like wooden crates make for cute and handy organizers. Use these to store shoes, extra sheets, clothes, and even food items. 10. Clean and organize regulary. 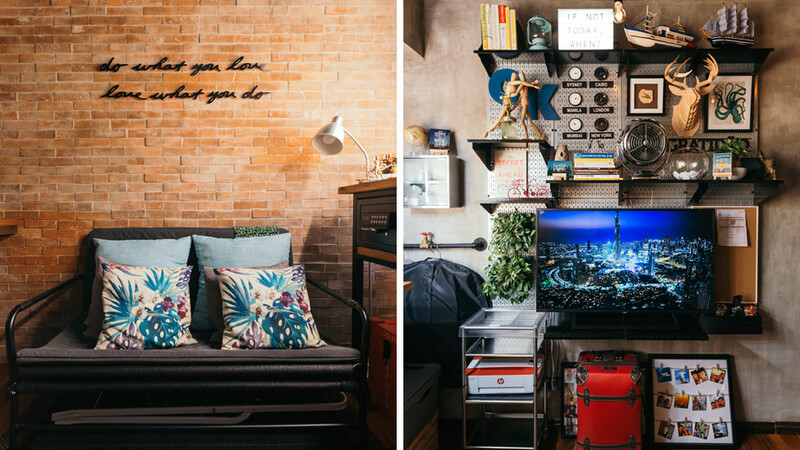 "A tidy space, however small, will always look brighter and bigger compared to unkempt ones," says the owner. Get rid of unnecessary items, sweep the floor, and dust the surfaces. A 10-minute cleaning routine can help you maintain order in a small space. Click here to see more photos and to learn more about this must-see condo unit.